The in hand function does not get the in hand item it wipes all nbt data and it wont get the version of a item so lets say if you have ID 33234 but then you have 7 times under that ID 33234#1, 33234#2, 33234#3, ,33234#4 and so on, so lets take my mod I just made in to acount here it means that if a user wants to clone a log they will only get the first log of the log index or the first ore from that ore index, this is a big over sight, also not not including nbt data is very out of date now and I sure a few times we mean to be getting this kind of support it's shocking we have to wait to 2x to get anything useful. We need a fix at lest for the ID#IINDEXID please fix this but also try add the NBT data to be included in the in hand and in off hand please. This is not NBT data but metadata. I will check if there is an easy implementation for this and try to implement it. May I see a picture of your whole procedure? There is no logs in neither the procedure nor the code. Are you sure you gave me the right procedure? 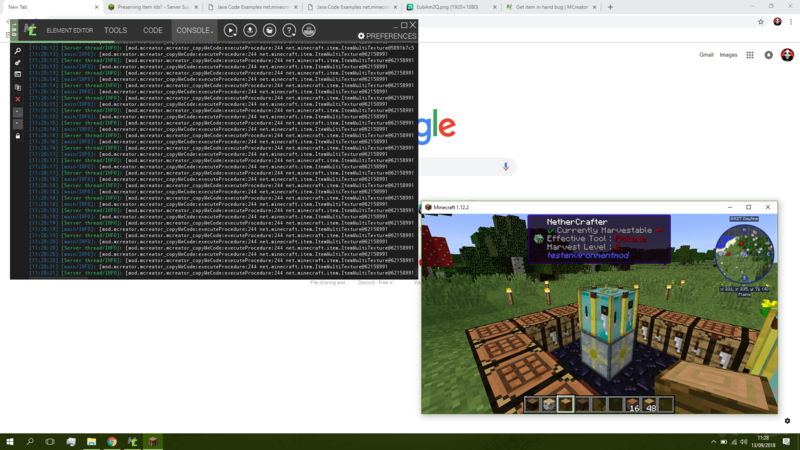 I have also added a image here I added a print command to when I was getting and you can see I am getting in return is not what I have the first two blocks are returning the last two blocks. But they all return 17/0 or 162/0 this happens for all blocks and items what are a item ID with a block index after it get hand is only getting the base ID not the id after it to tell the game or the player witch version of that block or item it is and since many mods group there items under one ID for each block type rather then each item having it's own ID it means many items can't be cloned as it will only return the base ID "ID/0"
Thank you for the info. I will check what could be causing this and try to fix this bug. This does not seem to be on the change log, have you missed this bug out ? it's kinda one that needs fixing to use this option right. 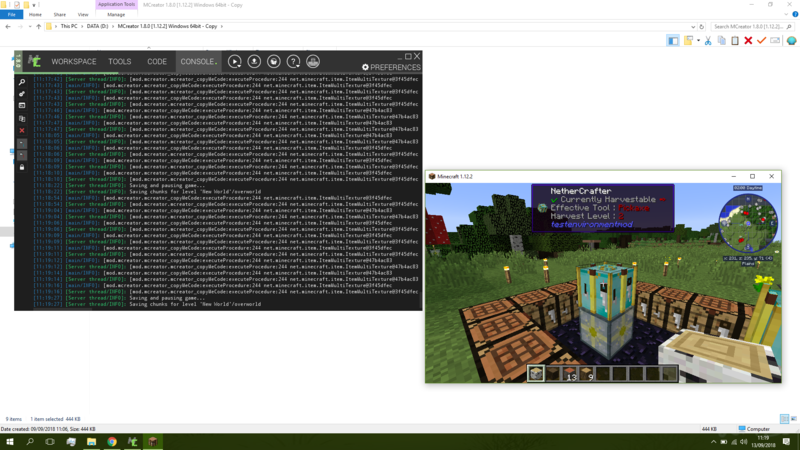 It was not fixed yet, I did not manage to fix it in time and didn't want to delay 1.8.1 too much. I hope I will be able to fix it in 1.8.2. I am sorry but this most likely won't make it in 1.8.2. I think I have found the cause for this, but a lot of procedure system restructuring will have to be done and this includes the risk of new bugs. As a lot of new features were already added in 1.8.2 and these can have bugs too, we will have to postpone this issue so things remain under control. I hope this answered your question. Well yes but it kinda of upsets me I been waiting to fix this bloody bug and so have others whom have made mods like mine and a few whom need it to check a item sub type, kinda feels like we can't trust a word you say as you been saying for about 2 versions now to fix this. unpack the dam templates so we can fix these things ourselves or give us the option to take the risk of functions that could create bugs is used as this is getting a joke now. I said it will be fixed in the future and it will be for sure. As I said, the fix will be very complex because the issue is not a trivial one. You can lock the code and edit the mod element that has this bug manually to fix this. I be willing to do that if you know what the fix is, I really don't mind locking the mod elements I had to in all older versions for the log rotations so I be willing to do it again, if you can provide a fix even tho it as to be done to each elements I be happy to do that until a future fix. Basically, the original code calls getItem() on itemstack wich returns item, but no metadata and creates a new itemstack out of it, now with default metadata. New code bypasses this step and metadata is preserved. 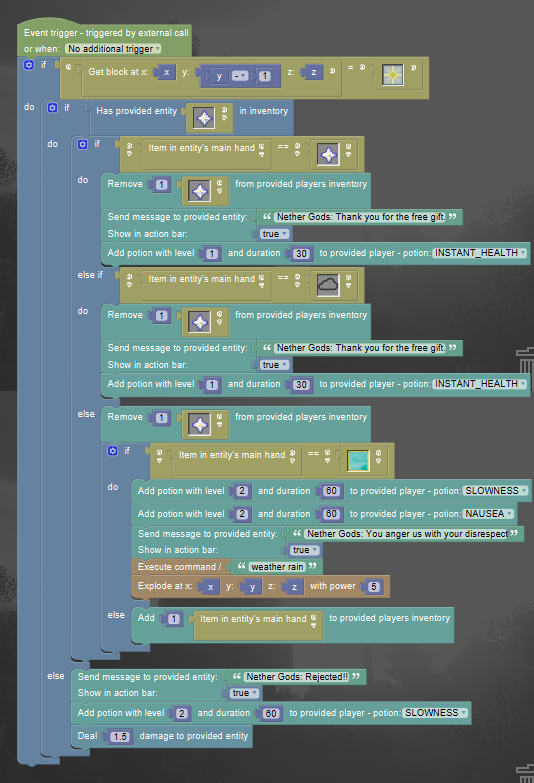 This seems like a trivial fix for a person, but inside MCreator, we do this with reason that by converting everything to itemstack, we have a universal object (itemstack) for both items and blocks. As I said, this can be fixed in MCreator too, but will require a lot of changes and I don't want to rush with this due to new potential bugs that could be introduced by doing this. Thanks for now and I hope to see it in the future but also happy for the temp fix. Is there something we missed here I read over this post a few times and I am sure I changed them right. Also I reading this I don't think this will fix the problem at hand the problem is when you try copy a a item was is a sub ID are you sure this will fix that?